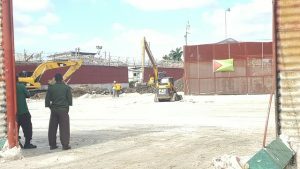 Ninety “really bad” prisoners are still in the walled swampy area at Lusignan, as more than GYD$500 million construction works continue at the Camp Street jail where high-tech scanners will be installed, authorities said. “There are still a number of prisoners in the swamped area. We felt that it was necessary because we do not want them to contaminate the 400 or more that are in the tarmac area. These are the real bad ones that have done a number of acts which make us believe that ud they were to go into that new area we might have further troubles,” Minister of Public Security, Khemraj Ramjattan told a news briefing. He said at least 400 prisoners were now in better conditions at an asphalted and roofed area. The Lusignan Prison building itself has 151 prisoners. Ramjattan said government at the next parliamentary sitting would be seekjng supplementary monies to rehabilitate the brick prison at Camp Street, build a kitchen, administrative building, infirmary and inner fence. “We want the real bad ones to be in a safe area in that new brick prison,” he said. That project could take as much as three months. The brick prison , the only structure that was left standing after the devastating fire at the Camp Street jail/ Georgetown Prison. 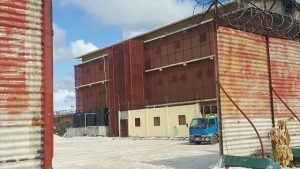 Prisons Director, Gladwin Samuels said the plans for the Camp Street jail would include the installation of scanners to detect and prevent prohibited items such as cell phones, weapons, lighters, matches and narcotics from being smuggled into the jail. He said a similar scanner has been already installed at the Lusignan prison. Samuels said he did not know about preventative medicine against such diseases like leptospirosis but assured that there are adequate systems in place to treat anyone who falls ill. The current swampy area at Lusignan, he said, would be filled with sand but much depends on cooperation from the prisoners to ensure the safety of construction workers . “Based on the estimates, the work can actually be done within 24 hours commencing tomorrow (Saturday) once we have the necessary cooperation. If it is a situation whereby we are required to deploy force in order to get the work done, well then we’ll have to do a detailed assessment because at this time we will not endanger the life of any contractor because we have to utilise specialist equipment to get in there,” he said. Prison authorities hope to use their training and expertise to “push” the prisoners to one side of the swampy area to facilitate the sand-filling. The Prisons Director said a hard drive containing the updated Inmate Management database has been saved and the records are all intact. Meanwhile, Police Commissioner, Seelall Persaud, meanwhile, said lawmen believed that Stafrei Alexander, who is wanted for unlawful escape from the Camp Street jail and for murder, was injured at Port Mourant during efforts to arrest him on Thursday. 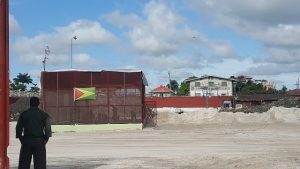 Rehabilitation works underway at the Camp Street Prison. Persaud said intelligence gathered so far is that each of the remaining four escapees are moving about separately. The Police Commissioner said there was no evidence to suggest that anyone aided Desmond James in hiding out in shack at West Demerara, but rather another inmate had given him money which he used to board public transportation. Fire Chief, Marlon Gentle said the probe into the Sunday, July 9, 2017 fire that destroyed the Georgetown Prison was still underway and a report would be provided subsequently.